Hollywood and the people that circulate through it are not necessarily noted for their integrity. Every now and then an exception occurs. One of those exceptions is my friend going on 40 years, stuntman Dean Smith. He’s always been a stand-up guy and one of the stuntmen I’ve tried to emulate in my own career. Dean is a consummate professional with an inordinate amount of agility and talent. His love of western films and the stars that made them is well known. He always tries to add something extra to every scene he is in, be it acting or stunting. Born in Breckenridge, TX, Dean spent his early years on his grandparents’ ranch. Here he learned his duties as a ranchhand and the rewards being close to the soil and animals can bring. 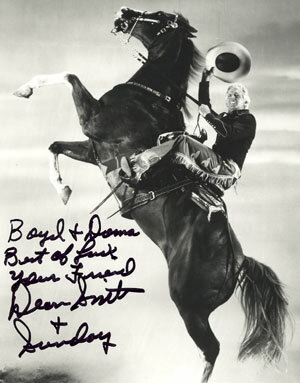 Dean spent Saturdays at the local movie house watching his cowboy heroes—Gene Autry, Monte Hale and Roy Rogers who left a lasting impression on young Dean and eventually led him into the film business. After Dean’s hitch in the Army he met a young fellow named James Baumgarner who was doing small parts in TV westerns at the time. This interested Dean very much as his thoughts drifted back to those wonderful days of watching his cowboy heroes. In the Fall of ‘57 Dean moved to California and looked up his old friend, now renamed James Garner. With Garner’s help it was not long before Dean was at work in his first film, “Born Reckless”, a rodeo yarn with Jeff Richards and Mamie Van Doren. Soon, Dean found himself in Sonora, CA, doubling for Dale Robertson who would become a life long friend. At the height of the TV western boom Dean’s credit sheet was indeed impressive with work on “Maverick”, “Gunsmoke”, “Iron Horse”, “Virginian”, “Bat Masterson”, “Outcasts”, “The F.B.I.”, “Tall Man”, “Have Gun Will Travel”, “Riverboat”, “Ironside”, “Zorro”, “Texas John Slaughter”, “Cimarron City”, “Wagon Train”, “Laramie”, “Lawman” and dozens of others. Dean’s ability and likable personality had him on a steady rise in Hollywood. He soon moved into bigtime feature films—“Cheyenne Autumn”, “Rio Bravo”, “Rio Lobo”, “The Alamo”, “Ulzana’s Raid”, “Macintosh and T.J.”, “The Undefeated”, “Big Jake”, “Rio Conchos” and “A Distant Trumpet”. In 1974, Dean had his first starring role as Kit Carson in the family film, “Seven Alone”. Dean is one of the best western stuntmen ever in the film business, but, as with all of us, you can’t make a living just doing westerns. Dean is also adept at fights, high falls, cars, fire gags and all other tricky things a top stuntman is called upon to perform. Dean and his horse, Sunday, perform at rodeos and dozens of charity events around the country each year. In the tradition of his cowboy heroes, he always has time for an autograph or photo with his admirers. There’s an old saying in the film business, “You can fool people out of the business, but you can’t fool people in the business.” Dean Smith never fooled anybody. He came to work to get the job done and did just that. I’m proud to call Dean Smith one of my oldest friends and loyalist supporters. 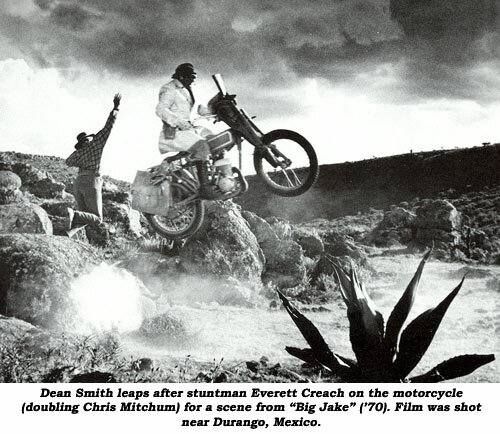 Dean Smith, top athlete, top horseman, top stuntman and true Texas gentleman.